Instead of cruising along the coast of Italy, tonight Celebrity Century is sitting at Villefranche waiting for its appointment in a drydock. Damage to the rudder has caused Celebrity Cruises to cancel the current cruise for an unscheduled drydock. Details appeared in the October 15, 2010, edition of Cruise News Daily. Back in August we told readers local reports from Jamaica were telling us the new port of Falmouth was seriously behind schedule and it didn't look to be anywhere near ready for the first cruise ship passengers scheduled to arrive in November. Cruise lines are now agreeing, and the lines planning to call there before the first of the year are now making alternate plans - at least until January. The first Oasis-class ships, for which the port was primarily built, aren't scheduled to arrive until March. The complete article appeared in the October 15, 2010, edition of Cruise News Daily. Princess Cruises had a bit of good news for the folks in Alaska today. They are increasing their Alaskan fleet by one ship in 2012. The news gets even better for the state because it will be one of their larger ships placed on the one way itinerary between Vancouver and Whittier. That will be an extra boost for the state's economy since most passengers taking this itinerary spend time inland in Alaska before or after the cruise, most of which also supports the extensive Princess ground operation, which has also been sagging due to the reduced cruise capacity. The complete article appeared in the October 14, 2010, issue of Cruise News Daily. Crew members aboard Carnival Splendor witnessed another crew member jumping overboard from the ship about 1:00am on Wednesday morning while the ship was en route to Puerto Vallarta. Details appeared in the October 14, 2010, edition of Cruise News Daily. CND subscribers also read about Carnival Magic's float out ... a new record for AIDAbella ... and a passenger overboard off the coast of France. Details appeared in the "Other Things You'll Want to Know" column in the October 14, 2010, edition of Cruise News Daily. AIDAbella assisted in breaking a record earlier this month, but we're not quite sure why anyone would want to hold this record. 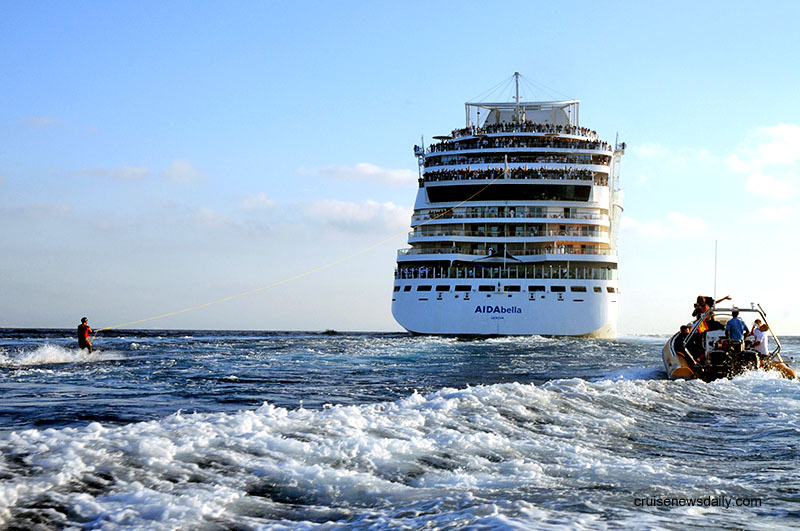 The 68,500-ton AIDAbella is now the largest ship every to pull a waterskier (certified by Guinness). Jan Schwiderek, a reporter for the German TV show "Galileo," was towed behind the cruise ship for six minutes and 25 seconds at a speed of 14 knots earlier this month (shown below). Using a "flying start," Schwiderek stepped onto his skis from a speedboat driving at full throttle in the Bay of Alicante. The early-morning feat was videotaped and will appear on the German TV show later this month. The cruise passengers watching the spectacle from the outside decks were amazed. "I've never witnessed anything like this before as a captain," said AIDA Captain Josef Husmann. "It's absolutely fantastic that we actually brought it off." AIDA is a brand of Carnival Corp which markets only in German-speaking countries. This story appeared in the October 14, 2010, edition of Cruise News Daily. Most cruise lines have a top chef in charge of designing their menus and creating signature dishes. Holland America Line has had Master Chef Rudi Sodamin in that for several years. Now he'll be taking on an expanded role as in a new initiative, the line's Culinary Council, which will enhance all aspects of their shipboard culinary operations. Details were in the October 13, 2010, edition of Cruise News Daily. Hurricane Paula formed in the western Caribbean and this week is affecting ships planning midweek calls at Yucatan ports. Carnival, Celebrity and Holland America are all reporting itinerary changes to avoid the storm. 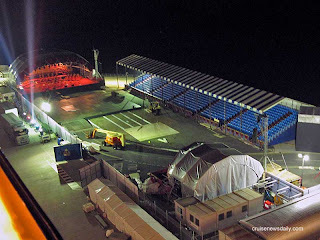 Details appeared in the October 13, 2010, issue of Cruise News Daily. Pop art icon Peter Max will be celebrating his birthday next week aboard Celebrity Solstice. The line will use the occasion to have a special party, a charity auction, and to roll out a new customized art option with Peter Max. It has been said that there are christenings and then there are Cunard christenings. And yesterday Cunard had a christening. On Sunday, describing what would happen in Monday's naming ceremony for Queen Elizabeth, Cunard president Peter Shanks said, "My job is to make sure the hair on the back of your neck stands on end." To accomplish that he rallied all the pageantry and splendor the British company could muster. In this CND article we look at how he accomplished it and what he says the new ship's role will be. We have other things on our blog we heard and saw at the weekend's event that you probably didn't read elsewhere. The complete article appeared in the October 12, 2010, edition of Cruise News Daily. Celebrity Cruises announced yesterday they would soon begin providing an "international marketplace" experience in the casual evening Lido dining venues aboard all their ships (except Celebrity Xpedition). It will be similar to what is currently being offered aboard the line's Solstice-class ships. The complete story appeared in the October 12, 2010 edition of Cruise News Daily. Her Majesty has been touring the ship while the naming ceremony has begun outside, and a 100-piece symphony orchestra, accompanied by a 150-voice chorus is entertaining the rest of us. 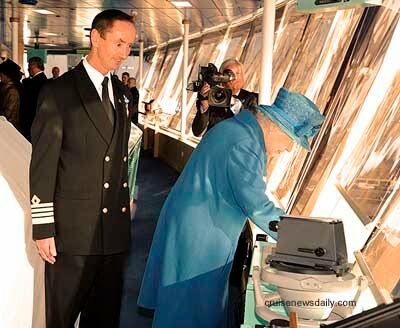 We can watch The Queen touring the vessel on large video monitors. She is being quite gracious with the staff and actually chatting with many as they are presented to her. And then she got to the bridge. After meeting the officers, Captain Wells gestured toward some of the controls. With that The Queen's arm stretch out and the ship's baritone whistle sounded drowning out the orchestra and the chorus, but not the gales of laughter that went up from the crowd in the stands. Her Majesty has arrived, and Cunard's Queen Elizabeth awaits her naming in just a few moments. Note the bottle is in position (above "Queen") standing at attention. Cunard's elaborate ceremony will begin in a few moments, the result of literally months of planning. Like many ships, there is a "secret" code in the carpet. It usually takes most people a few days to break the code. For Cunard's Queen Elizabeth, interior designer, Teresa Anderson says she put a red stripe in the carpet on the ship's port side (shown above), and a blue/green stripe in the carpeting on the starboard. Searchlights lit the sky Saturday night over Southampton's Ocean Terminal where Cunard's new Queen Elizabeth is docked waiting for her official naming on Monday by Her Majesty Elizabeth II. As seen here Saturday night, the venue where invited guests will witness the ceremony is almost complete off the liner's starboard bow. 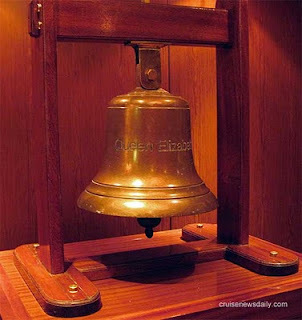 One of the pleasures about Queen Elizabeth is the small discoveries you make - things Cunard hasn't promoted - things you just happen onto. Here is one of them. The bell from Queen Elizabeth 2 is in the hallway leading to the Commodore's Club, just outside Churchill's Cigar Lounge. Yes, the clapper is still there, as a lot of bozos demonstrated last night as they walked past. It may have to be "neutered." 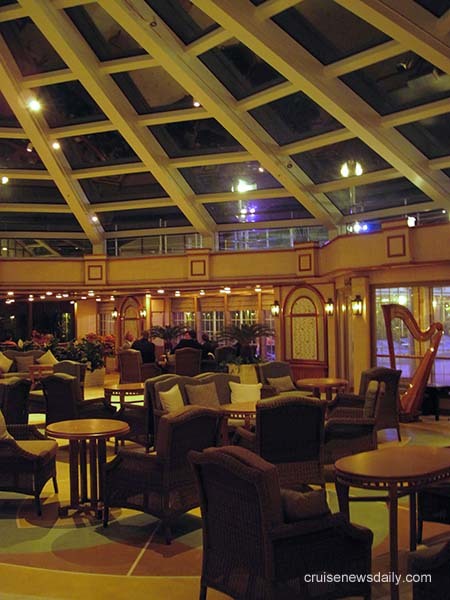 The Garden Lounge is one of the big changes from Queen Victoria to Queen Elizabeth. For Queen Elizabeth, Cunard raised the ceiling to create a striking skylight/dome, making the room much lighter and more dramatic. The Garden Lounge in this photo as it was seen last night looking toward the pool.